REDWOOD CITY, CA | March 20, 2017 -- On Friday, March 18, Jérôme Jarre along with Ben Stiller, Juanpa Zurita, Chaka “Chakabars” Clarke, and Casey Neistat launched a GoFundMe to fill a Turkish Airlines flight to Somalia with food. In just a few days, they have raised over $1.8 million from 63,000 donors in 125 countries -- enough money to fill at least 10 planes with famine relief supplies. 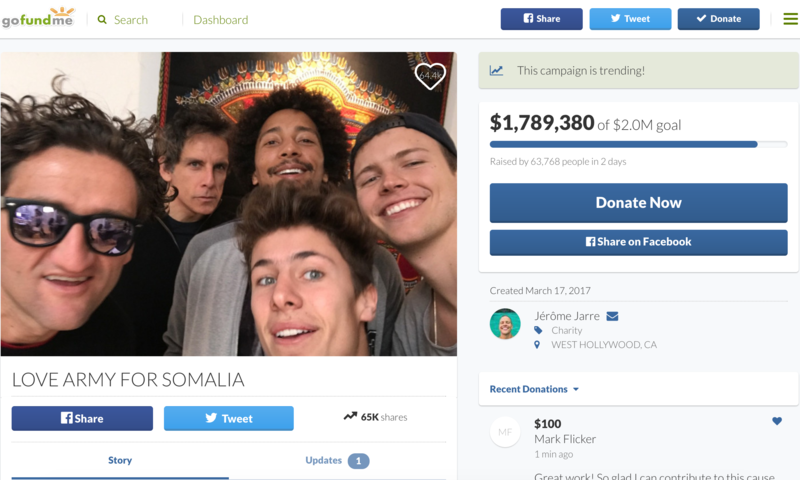 As Jérôme Jarre, Ben Stiller and Chakabars explain in new videos, they are moving on to the next phase of the “Love Army For Somalia” GoFundMe. They just launched the #NominatedForSomalia Challenge to raise money to install permanent solutions to provide water to those impacted by the drought. In the short term, the funds raised on GoFundMe will also be used for 2,000-liter water trucks to immediately help those in need. 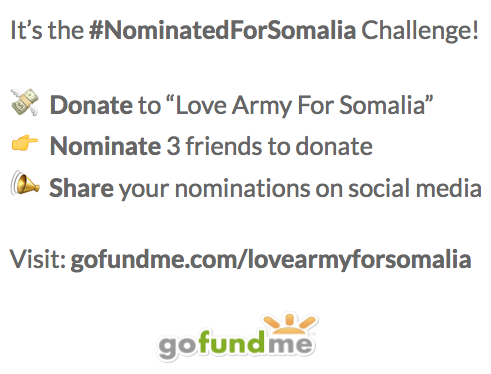 Jérôme Jarre and Ben Stiller have challenged every person who donated to “Love Army For Somalia” to nominate three friends to donate and share the GoFundMe. They want to grow the “Love Army For Somalia” and continue to encourage people all around the world to take action and support this important cause.